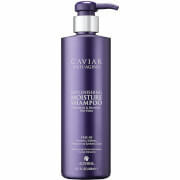 The Alterna Caviar Moisture Holiday Duo Set combines a luxurious shampoo and conditioner to replenish dry, damaged hair. Formulated with Seasilk (a blend of marine botanicals) and a proprietary Age-Control Complex, the pair work in synergy to nourish, protect and repair hair in need. A luxurious shampoo that restores moisture and repairs damaged strands. Improving the overall appearance of your hair, it expertly lifts away dirt and impurities while promoting radiant shine. Formulated with Caviar Extract and Seasilk, the shampoo helps to reduce breakage while enhancing moisture, elasticity and shine. A lipid-rich conditioner that nourishes and strengthens dry hair. Improving resilience to reduce breakage, the hydrating conditioner will soften and smoothen tresses while enhancing elasticity and shine with Caviar Extract and Seasilk. Shampoo: Massage throughout wet hair and rinse thoroughly. For best results follow with Caviar Moisture Conditioner. Shampoo: Water/Aqua/Eau, Disodium Laureth Sulfosuccinate, Sodium Cocoyl Isethionate, Sodium Lauryl Sulfoacetate, Cocamidopropyl Hydroxysultaine, Sodium Lauroyl Sarcosinate, Cocamidopropylamine Oxide, Acrylates Copolymer, Methyl Gluceth-20, Glycereth-26, Glycol Distearate, Alaria Esculenta Extract, Helianthus Annuus (Sunflower) Seed Oil, Linum Usitatissimum (Linseed) Seed Oil, Butyrospermum Parkii (Shea) Butter, Soy Amino Acids, Saccharomyces/Magnesium Ferment, Saccharomyces/Copper Ferment, Saccharomyces/Silicon Ferment, Saccharomyces/Zinc Ferment, Saccharomyces/Iron Ferment, Phospholipids, Tocopheryl Acetate, Superoxide Dismutase, Hydrolyzed Vegetable Protein PG-Propyl Silanetriol, Caviar Extract, Glycerin, Polysilicone-15, Ascorbic Acid, Divinyldimethicone/Dimethicone Copolymer, Guar Hydroxypropyltrimonium Chloride, Butylene Glycol, Caprylyl Glycol, Amodimethicone, Alcohol, Decyl Glucoside, Dihydroxypropyl PEG-5 Linoleammonium Chloride, Polyquaternium-7, Polyquaternium-10, Citric Acid, Aminomethyl Propanol, Pentasodium Triphosphate, Acetic Acid, Sodium Acetate, Sodium Phytate, Disodium EDTA, Tetrasodium EDTA, Lauryl Alcohol, C11-15 Pareth-7, C12-13 Pareth-3, C12-13 Pareth-23, Laureth-9, Trideceth-12, PEG-4 Laurate, PEG-4 Dilaurate, Hexylene Glycol, Isopropyl Alcohol, PEG-4, Chlorphenesin, Phenoxyethanol, Iodopropynyl Butylcarbamate, Benzoic Acid, Potassium Sorbate, Methylisothiazolinone, Sodium Benzoate, Fragrance (Parfum). (10-16-35249). 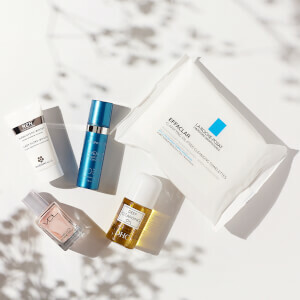 Conditioner: Water/Aqua/Eau, Cetearyl Alcohol, Behentrimonium Chloride, Cetrimonium Chloride, Isododecane, Glycerin, Dimethicone, Caviar Extract, Alaria Esculenta Extract, Butyrospermum Parkii (Shea) Butter, Linum Usitatissimum (Linseed) Seed Oil, Helianthus Annuus (Sunflower) Seed Oil, Hydrolyzed Rice Protein, Jojoba Esters, Saccharomyces/Magnesium Ferment, Saccharomyces/Copper Ferment, Saccharomyces/Silicon Ferment, Saccharomyces/Zinc Ferment, Saccharomyces/ Iron Ferment, Phospholipids, Superoxide Dismutase, Hydrolyzed Vegetable Protein PG-Propyl Silanetriol, Guar Hydroxypropyltrimonium Chloride, Tocopheryl Acetate, Amodimethicone, Caprylyl Glycol, Butylene Glycol, Isohexadecane, Tocopherol, Polysilicone-15, Disodium EDTA, Hydroxyethylcellulose, Sodium Acetate, Ascorbic Acid, Citric Acid, Acetic Acid, Glycereth-26, C11-15 Pareth-7, Laureth-9, Trideceth-12, PEG-4 Laurate, PEG-4 Dilaurate, PEG-4, Isopentyldiol, Isopropyl Alcohol, Phenoxyethanol, Potassium Sorbate, Benzyl Alcohol, Iodopropynyl Butylcarbamate, Sodium Benzoate, Fragrance (Parfum). (10-16-35826).